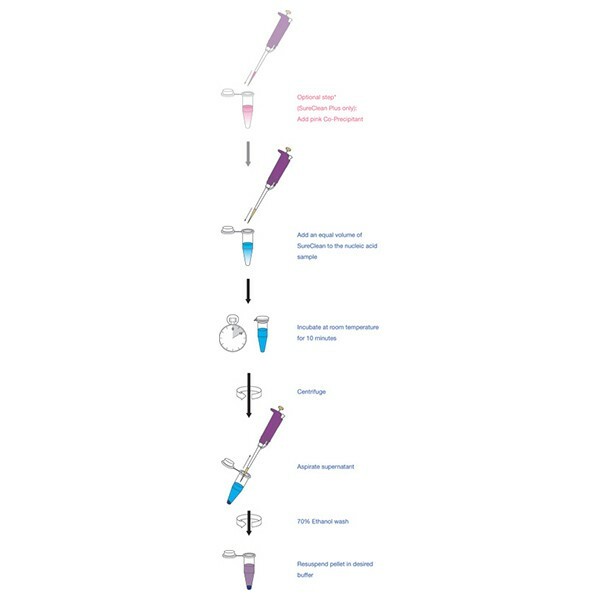 A novel, inexpensive, column-free approach to nucleic acid recovery or concentration, ideal for use in cloning, PCR or other routine molecular biology applications. SureClean Plus provides a simple, efficient method for the purification and concentration of DNA or dsRNA from PCR reactions or any enzymatic digests, without the need for hazardous reagents. SureClean Plus removes primers, primer-dimers, dNTPs and proteins. The protocol allows the precipitation of nucleic acids ≥75 bp with up to 98% recovery of the original sample, without the need for organic solvents, glass milk or expensive spin columns. Samples can be resuspended in any buffer and volume of choice, thus permitting the purification process to be tailored specifically to suit downstream experimental needs. SureClean Plus also includes a pink co-precipitant that can be added to the sample to facilitate easy visualization of the purified pellet. Co-precipitant Pink is a synthetic polyacrylamide, designed to aid recovery of nucleic acids. The co-precipitant does not interfere with downstream applications. SureClean Plus has been designed to deliver optimal performance during cloning and after end point PCR. HyperLadder 25bp was used to show the recovery rate and removal of smaller fragments using SureClean Plus and columns and protocols from supplier Q and X. Following recovery, the DNA was run on a 3% agarose gel. The results illustrate the high recovery rate of the SureClean Plus (lane 2) in comparison to Supplier Q (lane 3), where fragments as small as 25 bp were left (the size of dNTPs and primers in a PCR) and Supplier X (lane 4), where fragments smaller than 300 bp were removed (the size of many normal PCR products). Fast, inexpensive purification or concentration of DNA or dsRNA from PCR reactions and enzymatic digests. All components should be stored at room temperature. Do not freeze. Avoid exposure of Co-Precipitant Pink to light. What is the molecular weight cut off of SureClean Plus? SureClean Plus allows the precipitation of nucleic acids ≥75 bp, means it is possible to remove primers, primer-dimers and dNTPs as well as proteins (such as restriction enzymes, polymerases, etc.) from your sample. Does the Co-Precipitant Pink interfere with my planned downstream application? SureClean Plus also contains the Co-Precipitant Pink that can be added to the sample to facilitate easy visualization of the purified pellet. Although the Co-Precipitant Pink does not interfere with downstream applications such as cloning, PCR, real time PCR or enzymatic reactions, it is not compatible with spectrophotometric analysis of the DNA content.